While many film series change lead actors after a while, I can’t think of many that did so as quickly as the Jack Ryan flicks. Sean Connery stuck around as Bond for five flicks before he jumped ship, and at least Michael Keaton made it through two Batman movies before someone else took on the role. The only modern and high profile competition for the Ryan series comes from the Clarice Starling character. Jodie Foster played the role in 1991’s The Silence of the Lambs but bailed by the time they made its sequel, 2001’s Hannibal, as Julianne Moore took on the part in the second film. While that recasting probably created more of a ruckus, I still think the change from Alec Baldwin in 1990’s The Hunt For Red October to Harrison Ford in 1992’s Patriot Games remains a startling alteration. The lead actor didn’t offer the sole change between October and Patriot. Not only did Jack suddenly get about 16 years older, but also his wife changed names from “Caroline” to “Cathy” and she went from British to American! Star Trek: The Next Generation’s Gates McFadden played “Caroline” during a “blink and you’ll miss her” spot in October, during which the character literally appeared onscreen for no more than five seconds. Anne Archer took over as “Cathy” in Patriot and played a much more substantial role. One other interesting difference exists between Patriot and the other Ryan flicks. Whereas October earned a tame “PG” and the other films nabbed “PG-13”, Patriot stands alone as the only “R”-rated Ryan piece. I wish I could say that the movie merits an “R” for hard-bitten action and a rougher tone than the others, but that’s not really true. Frankly, I think it got the “R” just because it tosses around the “F”-word three or four times. The violence in Patriot Games doesn’t seem particularly bloody or nasty. It aspires to give us a brutal and direct effort, but while it offers a generally solid tale, it doesn’t quite achieve its goals. At the start of the film, Ryan is in London with wife Cathy and daughter Sally (Thora Birch, another acting change from October). While there, the heroic Ryan intercedes and foils an apparent assassination attempt, an action during which he kills Paddy Miller (Karl Hayden). Paddy’s protective older brother Sean (Sean Bean) gets arrested but not before he takes a long look at Ryan and clearly begins to internally plot his revenge on the man who snuffed his brother. After Jack testifies at Miller’s trial, the Ryans return to Annapolis Maryland. The terrorists wind their way toward America, where they have a few different missions in mind, including Miller’s plans to kill Jack and his family. At its best, Patriot Games provides a taut thriller, and the film’s strongest scene comes with the car chase midway through the flick. Director Phillip Noyce executes it in a clever and engrossing manner that makes it thrilling and tense. I especially like the amusing way that the baddies’ pursuit briefly gets halted. Unfortunately, Noyce doesn’t often repeat that tone elsewhere in the movie. At 116 minutes, Patriot becomes the second shortest of the five Ryan movies, but it feels like the longest, partially because it lacks much of a narrative. Essentially just an extended revenge piece, the parts of the plot related to the IRA and Northern Ireland feel gratuitous and have almost nothing to do with the overall theme. Perhaps those elements blended better in Tom Clancy’s original novel, but here they seem pointless. Actually, the Irish factors make Patriot appear both simplistic and excessively convoluted at the same time. While the movie’s plot remains simple, the different Irish elements cause much confusion and ultimately don’t make much sense. They aren’t well drawn or cleanly delineated, and they make the movie more of a chore to watch than they should. Perhaps the filmmakers hoped those pieces would distract from the drabness of the various characters. Ford did better with the role of Ryan in Clear and Present Danger, whereas in Patriot, he doesn’t quite seem to grasp the character’s non-violent nature. Ryan is supposed to be the quiet guy forced into aggressive situations, but here Ford makes him look a bit too forceful. The more passive tone came across much more effectively later, but in Patriot, Ford doesn’t get the personality. None of the three main terrorists ever distinguish themselves. Perhaps after the presence of such a dynamic antagonist in Red October the filmmakers felt they should dial the baddies back a notch. They go too far, unfortunately, as this flick’s crew don’t make much of an impression. It seems like a surprise to feel so dispassionately toward them, especially since the actors behind the roles have talent. I don’t want to convey the impression that I distinctly dislike Patriot Games, for I don’t. The movie gets a bit more interesting in its second half, and the climax offers some good drama, though it goes on far too long. While it seems moderately entertaining, Patriot simply fails to become anything more than that. Patriot Games appears in an aspect ratio of approximately 2.35:1 on this 4K UHD disc. The transfer didn’t excel but it largely delivered the goods. Sharpness was usually fine, as the majority of the movie showed appropriate clarity and accuracy. A fairly dark movie, interiors could seem a bit tentative, but overall definition appeared acceptable. I noticed no issues with jagged edges or moiré effects, and edge haloes appeared absent. Print flaws remained absent, but some digital noise reduction gave a few interiors a somewhat unnatural feel. While Patriot didn’t feature a terribly expansive palette, it nonetheless mustered clean and efficient colors. The hues came across as appropriately dynamic and bright and demonstrated no overt concerns. Black levels appeared deep and taut, and shadows felt acceptable. As noted, this tended to be a dimly-lit film much of the time, and interiors appeared a bit thick. Still, the overall image remained more than watchable and appeared to deliver the original photography in a reasonably accurate manner. The film’s Dolby TrueHD 5.1 soundfield seemed vivid and immersive. Though the movie lacked the number of broad audio opportunities heard in the other Ryan flicks, it still got in its fine demo moments. Gunfights offered expansive material, and the car chase heard partway through the film brought my system to life. The flick’s extended climax worked best of all. It took place during a well-illustrated thunderstorm and featured a lot of different elements that created a vibrant and broad sense of place. Quieter moments functioned nicely as well. The score displayed effective stereo imaging, and the audio always gave us a smooth feeling of atmosphere even when it didn’t kick into high gear. Some directional speech occasionally popped up as well. The surrounds acted as strong partners in the mix and featured a lot of useful unique elements. Audio quality sounded more than satisfactory. Dialogue came across as natural and crisp, and I noticed no instances of edginess or problems related to intelligibility. The moderately percussive score banged along with fine clarity and range and seemed nicely robust. Effects appeared clean and accurate. They never suffered from distortion, and they always remained tight and vivid. Bass response equaled the expected level of depth and tightness and added strong pop to the proceedings. This became a satisfying mix. How did the 4K UHD compare to the Blu-ray edition? Audio was identical, as both discs featured the same Dolby TrueHD track. Visuals became a different matter, as the 4K offered stronger clarity along with firmer blacks, livelier colors and a cleaner print. This remained a less than attractive film, but the 4K turned into a more satisfying rendition. All the extras appear on the included Blu-ray copy, where we find the movie’s theatrical trailer and a featurette called Patriot Games Up Close. 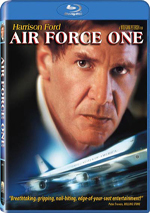 This 25-minute and 14-second program offers circa 2003 interviews with producer Mace Neufeld, director Phillip Noyce, actors Harrison Ford, James Earl Jones and Anne Archer, screenwriter Peter Iliff and associate producer Liz Kern. They cover how the producers choose to do Patriot after Red October, the departure of Alec Baldwin and entry of Harrison Ford, bringing in Phillip Noyce, altering the script to accommodate the casting change, locations, dealing with a middle-aged action hero, filming stunts, the Admiral Greer character, and shooting the desert attack sequence and the film’s climax. Though similar to the documentaries on the other Ryan discs, I thought this one displayed a little more flair, and it came across as the most compelling of the bunch. It delved into some intriguing material and did so in a reasonably engaging and taut manner. “Up Close” worked well to communicate the film’s challenges, and it gave us a concise and informative discussion of the movie. Patriot Games feels like an oddly distancing piece that doesn’t draw in the viewer terribly well. Professional and moderately entertaining, Patriot just doesn’t deliver the goods on a consistent basis. The 4K UHD offers generally good visuals as well as strong audio and a few bonus materials. I’m not wild about the movie but the 4K reproduces it fairly nicely. 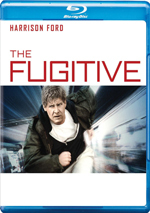 Note that as of August 2018, this 4K UHD version of Patriot Games can only be purchased via a five-movie package. 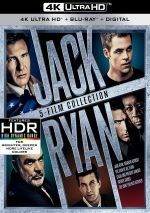 The “Jack Ryan Collection” also includes 4K UHD versions of The Hunt for Red October, Clear and Present Danger, The Sum of All Fears and Jack Ryan: Shadow Recruit.